The standard standing group pic, in front of the Purdue staples - the Boilermaker Special and the Armstrong statue. From L to R: Heng, Yajie, Ran, Mustafa, Shayok, Somali, Saurabh, Ashraf, Youssef (in his arms), Nada, Parinaz, Shikhar. The whole group after dinner Hard at play - Taboo - after dinner. 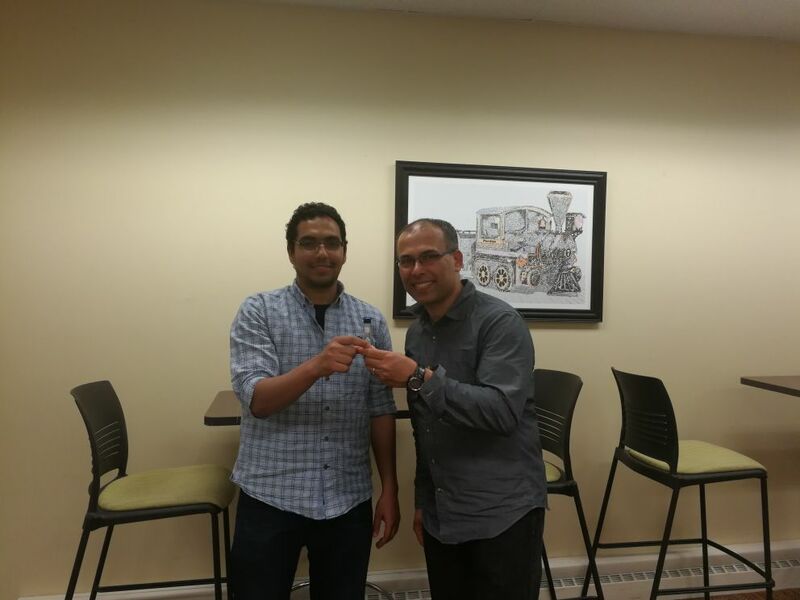 May 11, 2018: Ashraf winning the DCSL Group Champ award at the DCSL end Spring get-together, at the Purdue Graduate Student Lounge. 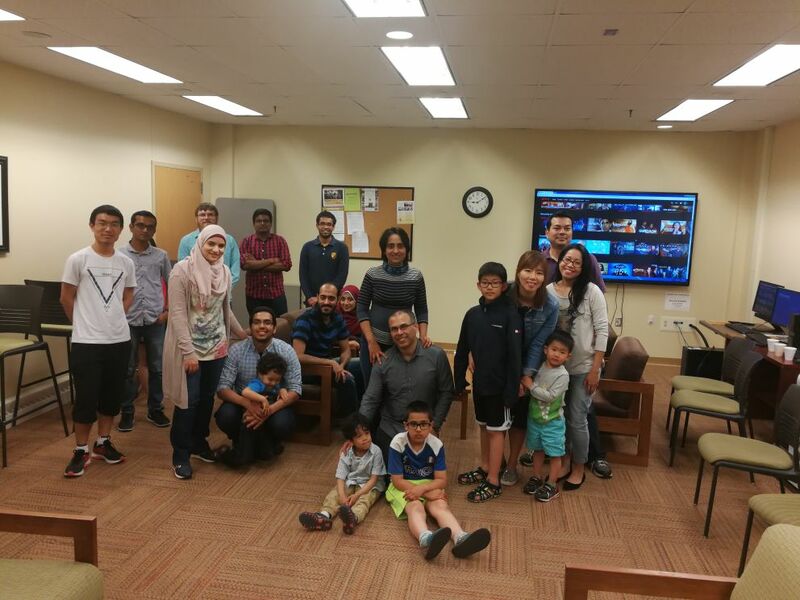 May 11, 2018: At the DCSL end Spring get-together, at the Purdue Graduate Student Lounge. 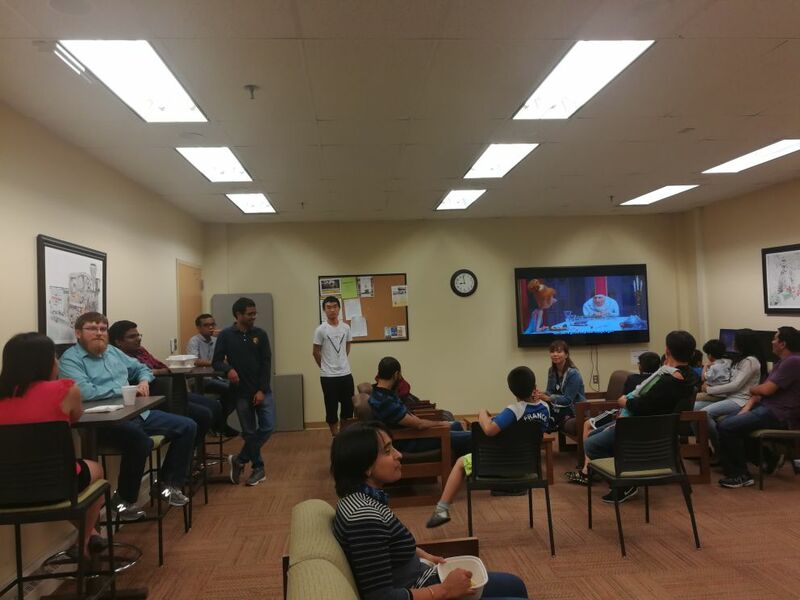 You see about half of current DCSL-ers winding down after the blur of papers, proposals, and presentations. May 11, 2018: DCSL-ers lounging about preparing for the big (Pictionary) battle. Guess which movie is on. May 11, 2018: DCSL-ers all together for the Kodak, er ... Instagram, moment. 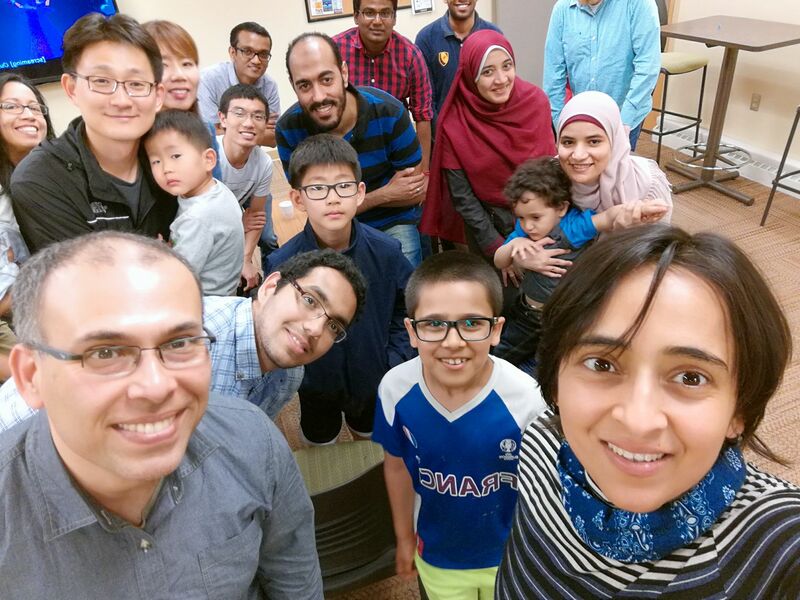 From left: Ran, Charitha, Paul, Nada (Ashraf's wife), Ashraf with Youssef (sitting), Subramaniyam, Ranvijay, Mustafa (sitting), Maha (Mustafa's wife, sitting), Ranvijay, Somali (Saurabh's wife), Saurabh (sitting) with Jose (Edgardo and Patricia's son) and Shayok (Saurabh and Somali's son), Matthew, Ji-Won (Jinkyu's wife), Aiden, Edgardo, Patricia (Edgardo's wife). Sep 2, 2017: At the DCSL beginning Fall get-together, at the Spaggedie's Italian Kitchen. Jul 28, 2017: With one of the graduating students, Kanak, at one of the local restaurants. 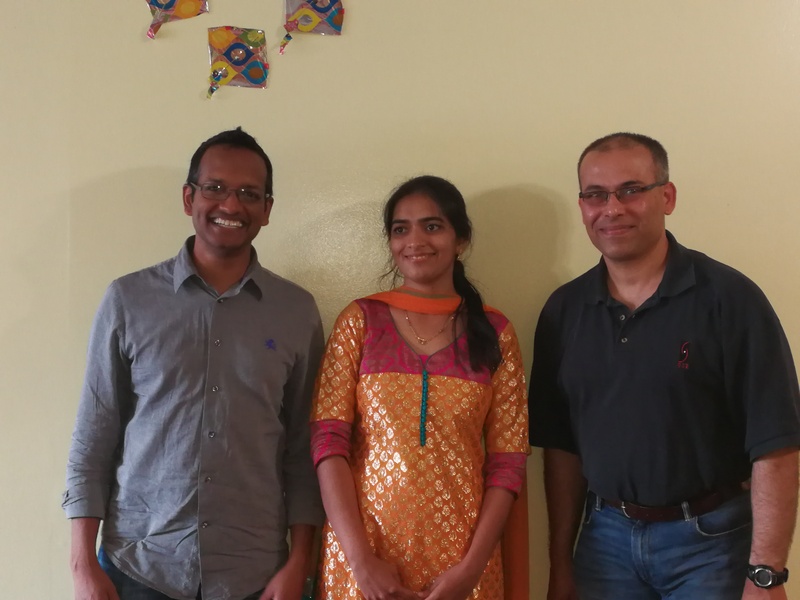 From left: Milind (Kanak's co-advisor), Kanak, Saurabh. 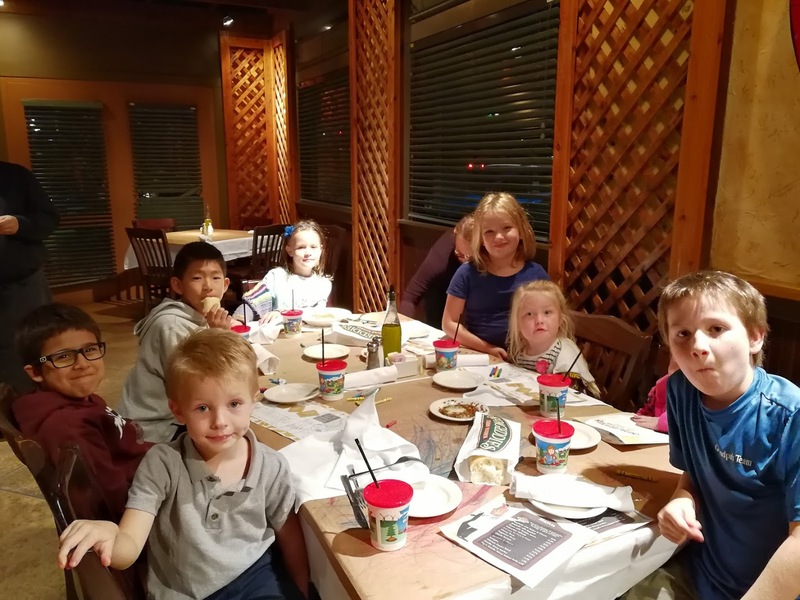 Sep 2, 2017: At the DCSL beginning Fall get-together, at the Spaggedie's Italian Kitchen. This is the kids' table. Jul 28, 2017: With some of the graduating students at one of the local hangouts. From left: Ayush, Tara, Somali with Shayok, Saurabh, Ashraf with Youssef, Nada. July 8, 2017: At the DCSL summer outdoor gettogether, at the Happy Hollow Park. 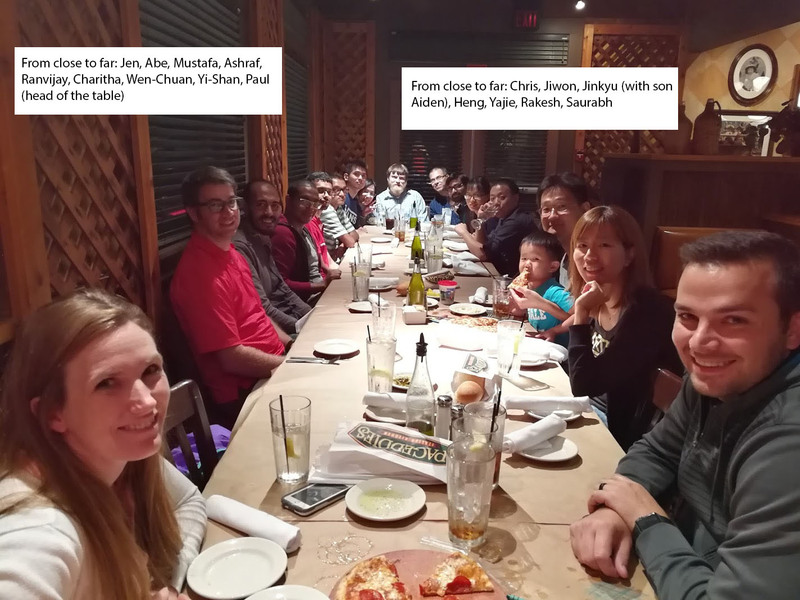 Food is laid out and a few of the attendees, the ones who are prompt in getting in line, are visible: (from left) Tara, Jinkyu, Pranavi, Abe’s kid Taggart, Jinkyu’s kid Matt, Nawanol, Somali, Saurabh’s kid Shayok, Amiya. Did I mention the yummy food – in 30 minutes it was almost all gone. July 8, 2017: Food is done. Now for some competitive Pictionary.